Historic Ellicott City is Alive with Incredible Events this Weekend! 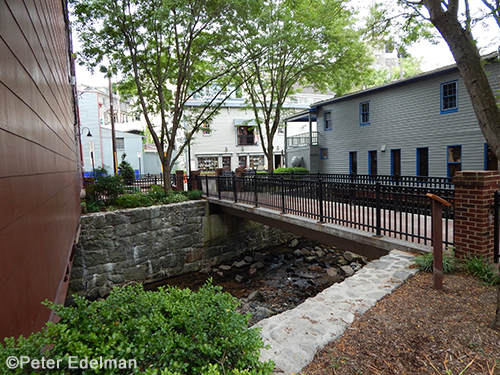 Amazing opportunities to check out in our wonderful Historic Ellicott City! Hope I don’t miss anything, here are a few things going on this weekend! West End Studios Art Opening/Pop Up Gallery Show is this evening, 7:00 – 10:00pm and tomorrow, 10:00am – 6:00pm. Check out amazing artists, Dee Cunningham of Deelite Designs, Scultors Bill Knapp and Barry Sheehan, Woodworker Ewan Tulis. They will all have their incredible works on display for purchase. Grab your art loving friends and be prepared to be amazed! Their talent is off the charts! The show is held in Dee’s studio, located on the west end of Main Street at: 8602 A Frederick Road, Ellicott City, MD 21043. For more info, please click here for the Facebook event page. Yappy Hour at The Wine Bin tonight, 6:00 – 9:00pm! Be sure to bring your furry friends, enjoy live music and Parfections chocolate tasting. Each Yappy Hour event, The Wine Bin collects donations for different charities. Tonight, they are collecting cat food for their pet food drive, so be sure to share your love and bring some food to donate. Plein Air, Paint-Out event in Ellicott City starts today! You’ll see creative artists throughout town with their easels and favorite mediums, creating their vision of our historic town. More information can be found here. The artists will have their finished works displayed at the Howard County Center for the Arts on July 16th, 6:00pm – 8pm. at a free reception. You will have the opportunity to purchase their art pieces. Farmer’s Market, tomorrow, 9:00 – 2:00pm. Enjoy this awesome, weekly event and take advantage of purchasing locally grown, farm-fresh vegetables, fruits and yummies! Remember, there are 2 locations. The Courtyards of Tonge Row will have live music from Jared Denhard! He’ll be performing with his Celtic Harp, Vintage Ukelele and Early American Gourd Banjo!! Over at the Wine Bin market, Colamiles will be adding his rhythmic sounds as your enjoy the sunshine and shop local! A big thank you to everyone involved in organizing and participating in Ellicott City Old Town Market! If you haven’t already done so, be sure to “like” their Facebook page by clicking here! July’s Second Sunday Art Market is this Sunday July 13th. The will have 11 artists & vendors attending with their works for sale. The judged participants in the Plein Air Paint It contest will have some of their other works on display and for sale at Mat About You as well. The Wine Bin’s Outdoor movie tomorrow night is Moonstruck! Be sure to grab your chairs and head to The Wine Bin for the 9:00pm showing. They offer coolers of ice to chill your beer and wine that you purchase from the Bin. They also offer popcorn and bottled water to benefit Voices for Children of Howard County. Celebrate History Saturday and Sunday, July 12 & 13th with the Monocacy Commemorative Weekend! Please check out the Howard County Historical Society’s website for all of the information. Historic Sites open 10:00am – 4:00pm with awesome activities taking place at the Thomas Log Cabin, Firehouse Museum, Patapsco Female Institute, Ellicott City Colored School Restored, Emory United Methodist Church, to name a few. There will be Civil War re-enactors throughout town, children’s activities. Please click here to check out the details of this wonderful event. Gosh, I hope I didn’t leave anything out! That’s one packed weekend of goodness taking place in our charming, historic town of Ellicott City! I hope you have a chance to take advantage of some of these events! Have a wonderful weekend! Gosh, hopefully I didn’t leave anything out! I hope that you’re able to enjoy some of these wonderful events that are taking place this weekend in our charming, historic Ellicott City! Whether you choose to be photographed in our studio, on location or along the quaint streets of our own beautiful historic town, you will truly enjoy your experience with Pam Long Photography. Clients enjoy a variety of portraiture, from maternity and babies, to children and families, high school seniors, pets, business headshots and special events. Whatever occasion life blesses you with, we will help you capture and document those moments to cherish for generations to come. To receive information about what we offer and how we can meet your needs, please contact us at 410.988.5563 to set up a complimentary consultation. We look forward to transforming your memories into your favorite works of art! Congratulations to the Class of 2014 and Thank You! We are so very proud of the Class of 2014 High School Seniors. We had the privilege of creating senior portraits for many tremendous graduates and enjoyed our time with each and every one of them. Whether they came in to our photography studio for just a yearbook photo or a full session with outfit changes, in our photography studio or out on location, each young person impressed us. When I take a look at our Class of 2014 Collage, below, fond memories literally come to the forefront of my mind with little things that went on during their photo shoots. We had fun photographing these high school seniors in our photography studio, up and down Main Street, finding cool little hide away nooks that we hadn’t before found, traveling to a beautiful barn, to the trails, the fields, along with many other great outdoor locations. We work very hard to ensure our clients will be photographed in the best possible way and it’s not uncommon that we work tirelessly, but we LOVE what we do. As I look at each one of the awesome members of the Class of 2014, I’m thankful, that because of the job I have and the career I’ve chosen, that I am blessed to have met people that I may not have otherwise met. I hope that when these young people move to the next stages of their lives, whether it’s college, the workforce, the service, or take a year off and travel ( okay, I threw that one in there so I can vicariously live through my own imagination 🙂 ), that their parents turn the corner of the hallway and see their beautiful wall portraits, desk prints, portrait art on their walls. and are reminded of the incredible children they raised. THANK YOU, to all of the high school seniors and to their parents, for trusting me and the staff at Pam Long Photography to create your portraits. To be able to capture a glimpse of your senior year and to know that in 5, 10, 20, 50 years, you will have these amazing images to see is quite a huge responsibility, and we gladly take it on. I hope your portraits bring great memories to the forefront of your mind when you look back at your senior year experience. Please be sure to stop by to say hello whenever you’re in the area. 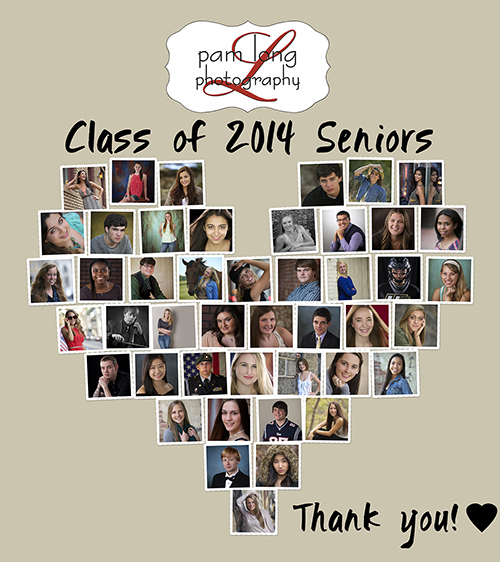 A very special thank you to our Class of 2014 Senior Spokesmodel Team. This great group of kids met up with me, before their senior year began, to have their senior photos taken. Many helped and volunteered in some of our community projects during the year, many offered to assist me on photo shoots during the year. They ALL brightened my year tremendously and we will miss them dearly. Thank you, to you and your parents, for everything. I hope you take a moment to enjoy the video slideshow of our Class of 2014 Spokesmodels. 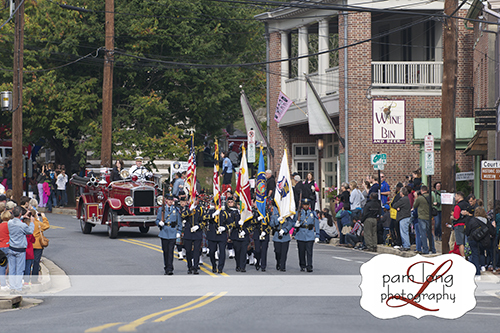 Why is Historic Ellicott City’s Main Street worthy of being a Cover Story in Parade Magazine? Parade Magazine is sponsoring a contest to see which of the incredible Main Streets throughout the US will be featured in a cover story at the end of the summer. Ellicott City is currently in the top 16, 8, Final 4! We hope that you consider to place your vote with Ellicott City’s Main Street. Please go here to vote: http://www.parade.com/mainstreet There are numerous reasons that Historic Ellicott City’s Main Street should be featured and grace the cover of Parade Magazine. It’s rich in history and culture, the community is comprised of residents, business owners and building owners that work together for the good of the town. Throughout the year, locals and out-of-towners can enjoy our wonderful Spring and Fall Festivals, Music Fests, Art Walks, Girls Night Out, First Friday celebrations, Midnight Madness….to name a few. 🙂 Our beautiful Main Street is lined with unique shops, boutiques, salons, artist’s studios and restaurants. I’ve enjoyed Ellicott City’s Main Street for many years, and it’s always been one of the first places I bring out of town visitors. I was thrilled to have the opportunity to move my photography studio there 2 years ago and thoroughly enjoy working with the other business owners and residents of this unique town. Our friendly Main Street has an eclectic group of people that enjoy it daily! I’m very proud to be a part of this charming town. I could go on and on telling you why you should consider voting for our Main Street, but I would like you to hear from some of the other residents, visitors, employees and business owners, as to why Ellicott City’s Main Street should be THE Main Street for the Parade Magazine’s cover story. 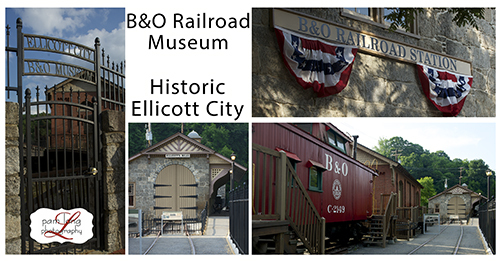 The B&O Railroad Museum, located in Ellicott City is the oldest surviving railroad station in America! What makes Ellicott City Special? How can you quantify it? Do you talk about the ancient stone, quarried from our own hills, used to build most of the buildings? Do you talk of the past, a town known for the mills and mill-workers that populated it, founded before our Country broke off on its own? Do you talk about the churches that dot the hillsides, overlooking a Main Street built next the river and rail line (the first rail line!) that was the bread and butter of the people living here? History like that is fascinating. But what makes Ellicott City special, is that its history is still alive today. It’s not just a place for preserving the past, held together behind glass to keep it safe. It lives. It’s a community of residents, shopkeepers and visitors who create an energy, a life and a bustle in the town. The dedication and love of these people are what preserves the history here. These people have refused to let developers turn the wood siding into modern plastics, small businesses into chain stores, and old, quirky buildings into personality-less office buildings. Each day in Ellicott City, the past meets with the present. Delicious coffee is brewed in a building that was once a funeral home, and goods are for sale in an old opera house. Tongue row, one legend says, got its name from women who would lean out the windows and wag their tongues at each other all day. People fill those buildings still, and actually talk to each other every day. It’s a fight to live and work here. Historic floods have decimated the town, poor economic turns have shadowed parts of Ellicott City’s past. The stones try to return to the ground from which they came, the waters try to rise up and the hills encroach. Developers look at Ellicott City and see dollar signs. Landlords are always tempted by that chain store, looking for a way to elbow itself into this slice of America’s past. But the community holds together, keeping the town clean, fresh, exciting, healthy and true. It’s a place where you can walk down the street, and say hello to people who genuinely care about you. Shopkeepers know you by name, residents know their neighbors, and visitors are always welcome. 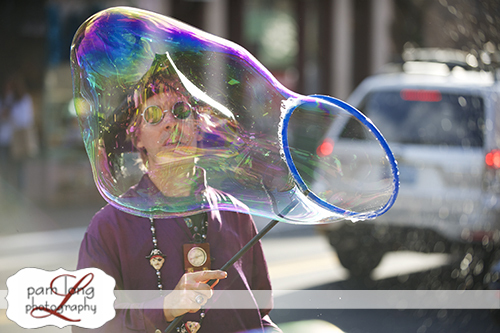 Barry, The Bubbleman, is a favorite on Main Street. Ellicott City’s Main Street is truly a unique and charming gem. What makes this particular Main Street extraordinarily special is it’s history and natural setting. The B&O railroad and museum at the end of the street, against the Tiber River, the whole street lined with granite walls, hundreds of years old, pushing into the streets in little beautiful shaded corners, keep the Old World feeling going throughout the entire street. Since 1772, rising like a phoenix from several disaters (floods, fires, war and wrecks) Ellicott City Main Street is a Civil War and “The Goddess” Hollywood movie star that shines today retaining our local color as Charm City’s sister. 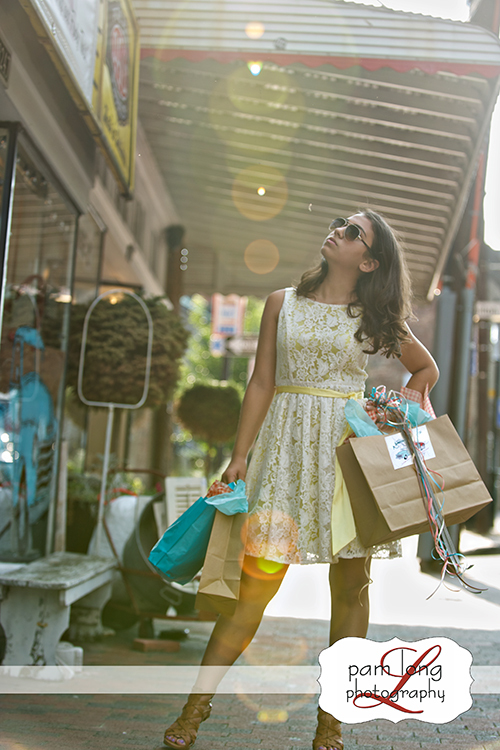 Main Street has a wonderful variety of shops and boutiques from which to shop….